Nobody gets the chance to die the way we wed us want it. Nobody gets the chance to die beautiful. But this movie proved us wrong because with the right people surrounding us, a beautiful and fabulous death is possible. A film by Jun Robles Lana, DGPI, Die Beautiful tells a story of Trisha Echevaria, a transgender woman who was forced to leave his patriarchal family due his sexuality. 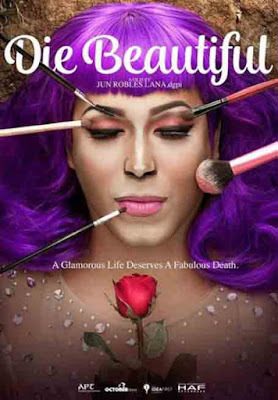 Played by Paolo Ballesteros, Trisha exemplifies a true-to-life experience of transgender woman here in the Philippines, where most of them compete and earn a living from joining "BeauCon" or local beauty pageants. Supported by Christian Bables, who played the role of Trisha's best friend Barb, Ballesteros and Bables showcased an outstanding rapport on comic and dramatic acting making the whole story catchy and alive all through two-hours of it. Ballesteros magnificent and fabulous make-up transformations were sewn impeccably in the movie making every segment of it worth waiting for. Also starring in this movie are Gladys Reyes, Joel Torre, Luis Alandy, Albie Casiño, Inah de Belen, IC Mendoza, Cedrick Juan, Lou Veloso with the special participation of Iza Calzado and Eugene Domingo. More than just an LGBT story, I personally think that Die Beautiful also shares a wonderful story of life and love that is accepted, honest and true. In a world where people can easily judge someone else base from their physical appearance, we should never forget to find comfort, care and love from those who see beyond our skin. Cheers to friends who never leave us and fight for us! Cheers to those who love us unconditionally and ask nothing in return! Cheers to people that despite of our differences still accept one another and let us live a happy and loving life! Lastly, cheers to the people who made this great movie! Thank you for sharing light about LGBT in a more contemporary and light way. I had a good laugh, and I had a great learning from this.